The classic Epic Traditional marquee is without doubt C&J Rentals' most requested product. This 'modern style' traditional marquee has been an important part of our business for many years and is especially popular with people wanting to create a romantic country style wedding. With swooping curves, high ceilings and a 'batwing' style valance, The Epic marquee looks stunning both inside and out, in any setting. We stock a large range of sizes including 20', 30', 40' and 60' width tents, allowing huge flexibility for planning events and maximising floor space. The Epic Traditional marquee is adaptable to both grassy and hard terrain whilst providing the height and space that many people seek to maximise impact and atmosphere at their event. Fully lined and heated with stunning French-style windows, we highly recommend this marquee if you require something with more character and style than the simple frame structure. 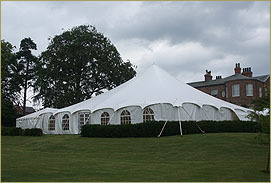 To make an enquiry about hiring an Epic Marquee please do not hesitate to contact us.